Kermanshah (Southern Kurdish: کرماشان - Kirmaşan Persian: کرمانشاه‎‎, Kermānshāh, also known as Bakhtaran, Bākhtarān, Kermānshāhān), the capital of Kermanshah Province, is located 525 kilometres (326 miles) from Tehran in the western part of Iran. According to the 2011 census, its population is 851,405. People mostly speak Southern Kurdish. Kermanshah has a moderate and mountainous climate. Kermanshah is the largest Kurdish-speaking city in Iran. Majority of people in Kermanshah are Shia Muslims, and there are minorities such as Sunni Muslims, Yarsanism and so on. Because of its antiquity, attractive landscapes, rich culture and Neolithic villages, Kermanshah is considered one of the cradles of prehistoric cultures. According to archaeological surveys and excavation, the Kermanshah area has been occupied by prehistoric people since the Lower Paleolithic period, and continued to later Paleolithic periods till late Pleistocene period. The Lower Paleolithic evidence consists of some handaxes found in the Gakia area to the east of the city. The Middle Paleolithic remains have been found in the northern vicinity of the city in Tang-e Kenesht and near Taqwasan. Neanderthal Man existed in the Kermanshah region during this period. The known Paleolithic caves in this area are Warwasi, Qobeh, Malaverd and Do-Ashkaft Cave. The region was also one of the first places in which human settlements including Asiab, Qazanchi, Tappeh Sarab, Chia Jani, and Ganj-Darreh were established between 8,000-10,000 years ago. This is about the same time that the first potteries pertaining to Iran were made in Ganj-Darreh, near present-day Harsin. In May 2009, based on a research conducted by the University of Hamedan and UCL, the head of Archeology Research Center of Iran's Cultural Heritage and Tourism Organization announced that the one of the oldest prehistorian village in the Middle East dating back to 9800 B.P., was discovered in Sahneh, located west of Kermanshah. Remains of later village occupations and early Bronze Age are found in a number of mound sites in the city itself. In ancient Iranian mythology, construction of the city is attributed to Tahmuras, the third king of Pishdadian dynasty. It is believed that the Sassanids have constructed Kermanshah and Bahram IV (he was called Kermanshah, meaning king of Kerman) gave his name to this city. It was a glorious city in Sassanid period about the 4th century AD when it became the capital city of Persian Empire and a significant health center serving as the summer resort for Sassanid kings. In AD 226, following a two-year war led by the Persian Emperor, Ardashir I, against "Kurdish" tribes in the region, the empire reinstated a local "Kurdish" prince, Kayus of Medya, to rule Kermanshah. At the time, the term "Kurd" was used as a social term, designating Iranian nomads, rather than a concrete ethnic group. The word became an ethnic identity in the 12th and 13th century. Within the dynasty known as the House of Kayus (also Kâvusakân) remained a semi-independent kingdom lasting until AD 380 before Ardashir II removed the dynasty's last ruling member. Kermanshah was conquered by the Arabs in AD 640. Under Seljuk rule in the eleventh century, it became the major cultural and commercial center in western Iran and the southern Kurdish-inhabited areas as a whole. The Safavids fortified the town, and the Qajars repulsed an attack by the Ottomans during Fath Ali Shah's rule (1797–1834). Kermanshah was occupied by Ottomans between 1723–1729 and 1731-1732. Occupied by the Imperial Russian army in 1914, followed by the Ottoman army in 1915 during World War I, it was evacuated in 1917 when the British forces arrived there to expel the Ottomans. Kermanshah played an important role in the Iranian Constitutional Revolution during the Qajar dynasty period and the Republic Movement in Pahlavi dynasty period. The city was harshly damaged during the Iran–Iraq War, and although it was rebuilt, it has not yet fully recovered. After the revolution in 1979, the city was named Ghahramanshahr for a short period of time, and later the name of the city as well as the province changed to Bakhtaran, apparently due to the presence of the word "Shah" in the original name. Bakhtaran means western, which refers to the location of the city and the province within Iran. After the Iran–Iraq War, however, the city was renamed Kermanshah, as it resonated more with the desire of its residents, the Persian literature, and the collective memory of the Iranians. Kermanshah has a climate which is heavily influenced by the proximity of the Zagros mountains, classified as a hot-summer Mediterranean climate (Csa). The city's altitude and exposed location relative to westerly winds makes precipitation a little bit high (more than twice that of Tehran), but at the same time produces huge diurnal temperature swings especially in the virtually rainless summers, which remain extremely hot during the day. Kermanshah experiences rather cold winters and there are usually rainfalls in fall and spring. Snow cover is seen for at least a couple of weeks in winter. Kermanshah sights include Kohneh Bridge, Behistun Inscription, Taghbostan, Temple of Anahita, Dinavar, Ganj Dareh, Essaqwand Rock Tombs, Sorkh Deh chamber tomb, Malek Tomb, Hulwan, Median dakhmeh (Darbad, Sahneh), Parav cave, Do-Ashkaft Cave, Tekyeh Moaven al-molk, Dokan Davood Inscription, Sar Pol-e-Zahab, Tagh e gara, Patagh pass, Sarab Niloufar, Ghoori Ghale Cave, Khajeh Barookh's House, Chiyajani Tappe, Statue of Herakles in Behistun complex, Emad al doleh Mosque, Tekyeh Biglarbeigi, Hunters cave, Jamé Mosque of Kermanshah, Godin Tepe, Bas relief of Gotarzes II of Parthia, and Anobanini bas relief. Taghbostan is a series of large rock reliefs from the era of Sassanid Empire of Persia, the Iranian dynasty which ruled western Asia from 226 to 650 AD. This example of Sassanid art is located 5 km (3 mi) from the city center of Kermanshah in western Iran. 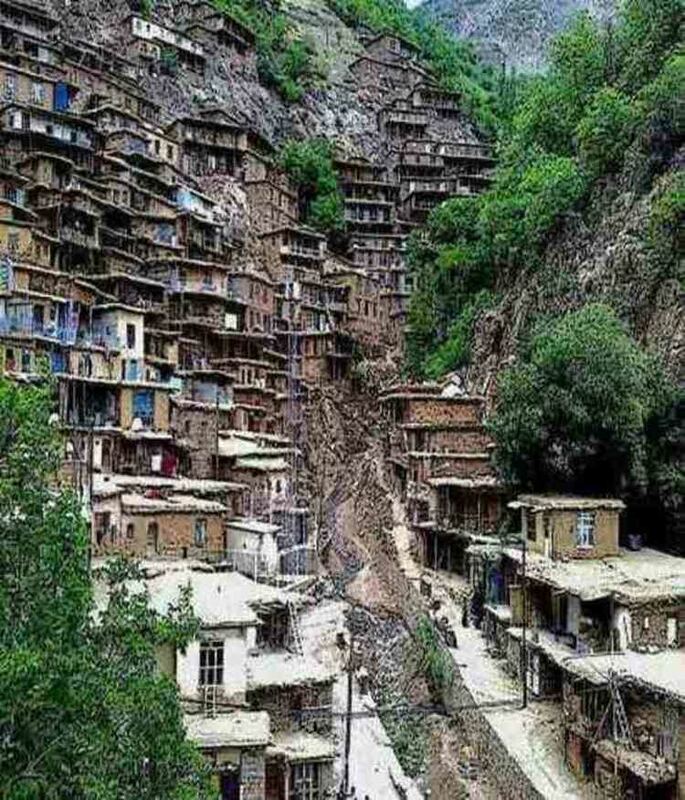 It is located in the heart of the Zagros mountains, where it has endured almost 1,700 years of wind and rain. The carvings, some of the finest and best-preserved examples of Persian sculpture under the Sassanids, include representations of the investitures of Ardashir II (379–383) and Shapur III (383–388). Like other Sassanid symbols, Taghbostan and its relief patterns accentuate power, religious tendencies, glory, honor, the vastness of the court, game and fighting spirit, festivity, joy, and rejoicing. Sassanid kings chose a beautiful setting for their rock reliefs along an historic Silk Road caravan route waypoint and campground. The reliefs are adjacent a sacred spring that empties into a large reflecting pool at the base of a mountain cliff. Taghbostan and its rock relief are one of the 30 surviving Sassanid relics of the Zagros mountains. According to Arthur Pope, the founder of Iranian art and archeology Institute in the USA, "art was characteristic of the Iranian people and the gift which they endowed the world with." One of the most impressive reliefs inside the largest grotto or ivan is the gigantic equestrian figure of the Sassanid king Khosrau II (591-628 AD) mounted on his favorite charger, Shabdiz. Both horse and rider are arrayed in full battle armor. The arch rests on two columns that bear delicately carved patterns showing the tree of life or the sacred tree. Above the arch and located on two opposite sides are figures of two winged angels with diadems. Around the outer layer of the arch, a conspicuous margin has been carved, jagged with flower patterns. These patterns are also found in the official costumes of Sassanid kings. Equestrian relief panel measured on 16.08.07 approx. 7.45 m across by 4.25 m high. Behistun inscription is considered as a UNESCO World Heritage Site. The Behistun Inscription (also Bisitun or Bisutun, Modern Persian: بیستون ; Old Persian: Bagastana, meaning "the god's place or land") is a multi-lingual inscription located on Mount Behistun. The inscription includes three versions of the same text, written in three different cuneiform script languages: Old Persian, Elamite, and Babylonian. A British army officer, Henry Rawlinson, had the inscription transcribed in two parts, in 1835 and 1843. Rawlinson was able to translate the Old Persian cuneiform text in 1838, and the Elamite and Babylonian texts were translated by Rawlinson and others after 1843. Babylonian was a later form of Akkadian: both are Semitic languages. In effect, then, the inscription is to cuneiform what the Rosetta Stone is to Egyptian hieroglyphs: the document most crucial in the decipherment of a previously lost script. The inscription is approximately 15 metres high by 25 metres wide, and 100 metres up a limestone cliff from an ancient road connecting the capitals of Babylonia and Media (Babylon and Ecbatana). It is extremely inaccessible as the mountainside was removed to make the inscription more visible after its completion. The Old Persian text contains 414 lines in five columns; the Elamite text includes 593 lines in eight columns and the Babylonian text is in 112 lines. The inscription was illustrated by a life-sized bas-relief of Darius, holding a bow as a sign of kingship, with his left foot on the chest of a figure lying on his back before him. The prostrate figure is reputed to be the pretender Gaumata. Darius is attended to the left by two servants, and ten one-metre figures stand to the right, with hands tied and rope around their necks, representing conquered peoples. Faravahar floats above, giving his blessing to the king. One figure appears to have been added after the others were completed, as was (oddly enough) Darius' beard, which is a separate block of stone attached with iron pins and lead. During the Qajar dynasty (1794 to 1925), Kermanshah Bazaar, mosques and tekyehs such as Moaven al-molk Mosque, and beautiful houses such as Khajeh Barookh's House were built. Tekyeh Moaven al-molk is unique because it has many pictures on the walls that relate to shahnameh, despite some of its more religious ones. Khajeh Barookh's House is located in the old district of Faizabad, a Jewish neighborhood of the city. It was built by a Jewish merchant of the Qajar period, named Barookh/Baruch. The house, an historical depiction of Iranian architecture, was renamed "Randeh-Kesh House", after the last owner, is a "daroongara"(inward oriented) house and is connected through a vestibule to the exterior yard and through a corridor to the interior yard. Surrounding the interior yard are rooms, brick pillars making the iwans(porches) of the house, and step-like column capitals decorated with brick-stalactite work. This house is among the rare Qajar houses with a private bathroom. Yahoudi-ha Bazar(Jewish Bazar) or (Islami Bazar) - It is one of the oldest shopping centers in Iran from Qajar period(1785–present) in which you can find traditional clothes, the Kurdish traditional cloth, miscellaneous spice, Giweh, hand made metal knife, hand made leather, and some blacksmith stores, and some stores which sell distilled water from medical plants and flowers. Kermanshah is one of the western agricultural core of Iran that produces grain, rice, vegetable, fruits, and oilseeds, however Kermanshah is emerging as a fairly important industrial city; there are two industrial centers with more than 256 manufacturing units in the suburb of the city. These industries include petrochemical refinery, textile manufacturing, food processing, carpet making, sugar refining, and the production of electrical equipment and tools. Kermanshah Oil Refining Company (KORC) established in 1932 by British companies, is one of the major industries in the city. After recent changes in Iraq, Kermanshah has become one of the main importing and exporting gates of Iran.